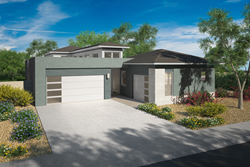 Award winning Arizona-based development firm, Desert Viking, teams up with Venture REI to introduce Tivoli at Spectrum, a one-of-a-kind Gilbert community featuring luxury modern home designs with a family-friendly appeal. Desert Viking, a Phoenix-based real estate development company, has teamed up with leading brokerage firm, Venture REI, to create a unique experience for homebuyers in the East Valley. They're bringing modern style architecture to an area much populated by the traditional style of home. Over the last few years, there has been an influx of new construction in the East Valley. Many show more open and contemporary layouts. However, the overall architectural style has greatly remained unchanged, despite the desire of potential homebuyers to see the Gilbert Real Estate market adapt to a more modern style of home. "We surveyed the area, and we really paid attention to the needs of the community," says Niels Kreipke, President of Desert Viking. "Over and over again, we were told by buyers that they want to see more modern, upscale homes available in the East Valley." Indeed, Tivoli is unique, offering homes that boast unconventional design, clean and sleek elevations, and a luxury feel that appeals to contemporary buyers. "We didn't want to do anything cookie cutter," says Lynn Siedschlag, Senior Project Manager of Desert Viking. "Our standard features are high-quality. We wanted to give buyers the high-end feel that they usually have to travel to Scottsdale to receive." Indeed, Tivoli at Spectrum will be a marvel among its neighboring communities. With a total of 14 homes, the architecture at Tivoli is both distinguished, yet inviting; easily combining luxury living with a family friendly appeal that the Spectrum community is known for. With 1 and 2 story homes starting at 3200 square feet, Tivoli features thoughtfully-designed oversized lots and large grand entrances, with enough space and flexibility to adapt to a growing family's needs. "There's nothing like it in the East Valley, and only a few examples of anything similar in all of Arizona, " says Kreipke. Nestled among Gilbert's most valued residential area, Spectrum's amenities hold everything intelligent homeowners want, from a 3,800 square foot Clubhouse to nearby shopping at San Tan Village Mall. It’s also a short 15-minute drive from the wide array of dining options offered in Downtown Gilbert. Tivoli, in itself, is a striking example of what Desert Viking excels at; transforming an underutilized space into an esteemed high-end living community that adds tremendous value to the entire surrounding area. "It's been exciting and fulfilling to renovate this undervalued space, and convert it into something that the community truly wants," Siedschlag says. Founded by Niels Kreipke in 1997, the Desert Viking Company is highly regarded for its commitment to rehabilitating and restoring historical buildings & attractions here in Arizona, while adding modern style to thriving neighborhoods. As an Arizona-based boutique development firm, the company has received numerous honors, including the 2004 Governor's Heritage Preservation Award. The partnership with Venture REI & Dan Noma Jr., one of Arizona's top residential agents, represents their commitment to creating a personalized, concierge-like home-buying experience to prospective Spectrum buyers. Tivoli is located at 2928 Spectrum Way in Gilbert. For inquiries, please call 480-447-7501 or visit tivoligilbert.com for more information.